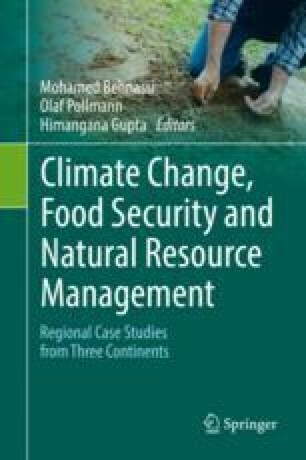 In this paper, the impact of climate change on water demand in the Middle Draa Valley (south of Morocco) has been analyzed. The study is based on the outputs of two software runs under socio-economical and climate change scenarios. The Statistical downscaling models (SDSM) that allow the observation of climate change at local level were used. The outputs were used to evaluate the impact of climate change on water demand, and as input to the Water Evaluation and Planning System (WEAP) to simulate water systems. The result predicts increase in mean temperatures from 1.4 to 3 °C and decrease in precipitation by approximately 3.9–15% in a number of scenarios considered in the study. The estimation of water balance is made through WEAP model; which shows that the study area will suffer from a lack of water supply due to the impact of climate change and the increase of water demand, which will be accelerated by high population growth. Sincere thanks go out to the reviewers who helped in improving this work. We would like to thank SEI for the WEAP software license granted to the first author. We would like to acknowledge Dr. Ben Salem A. and Dr. Rochdane S. for assisting in use of WEAP software. GCPH (2004) General census of the population and housing. https://rgph2014.hcp.ma/ Accessed 09 May 2015. Karmaoui, A., Ifaadassan, I., Babqiqi, A., Messouli, M., & Yacoubi Khebiza, M. (2015a). Analysis of the water supply-demand relationship in the Draa valley basin, Morocco, under climate change and socio-economic scenarios. Journal of Scientific Research & Reports. https://doi.org/10.9734/JSRR/2016/21536.